Our columnist served as governor or Florida: 1955- 1961. The mausoleum is unique in Tallahassee's Oakland Cemetery. While the grounds around it have been kept with reasonable care. The structure itself has been left on its own. No one has any record of it ever being cleaned or repaired, and the street grime of decades has blackened it in streaks and splotches like the old stone building of London. The four low cemented-over brick posts marking the corners of the lot all have either tumbled down from neglect, or been pushed down by marauders. 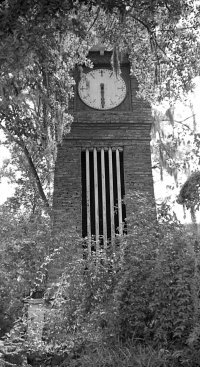 The community has made little notice of the mausoleum, or evidenced any special appreciation of its charm, and yet it was recently described by Joseph N. Clemons, architect of Tallahassee, in these terms: "It is most impressive, and I would say exciting. It is like a medley of music combining Mozart. Bach, Beethoven and Handel. There is no dominant design yet it combines the beauty of many early architectural masters. It is certainly eclectic. The four corners with fluted columns are Doric, yet they are topped with pineapple shaped symbols of friendship. At the top of each corner are two emerging shell-shaped forms that appear to be of early Greek design. Surrounding the base of the dome are turret forms that are typically Roman. The dome itself that dominates, as all domes should, reflects Indian or East Oriental forms, very reminiscent of the Taj Mahal, and other old structures of that region. There is nothing about the mausoleum that wasn't well designed. But the whole is either a design product of many artists, from many lands, or the work of a single designer well versed in the early architecture of many lands, and striving successfully to harmonize the best of everything he knew that was old and good." The one entry door on the east side is crudely locked, evidencing culpable meddling that has occurred over the years. 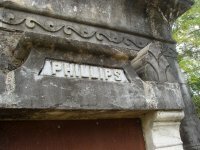 Above the door, in letters 6 inches high, is the name PHILLIPS. No first or middle name is provided, no date of birth or death, not one descriptive or commemorative word to explain to a visitor who "Phillips" was. Obviously, he wanted it this way. Research by Tallahassee Democrat reporters Hettie Cobb (1977) and Steve Yates (1947) developed some clues, but no real solution to this mystery. His name was Calvin C. Phillips. There is no local record of when or where he was born, but he died in November 1919, in Tallahassee, leaving a wife and two daughters all of whom had remained in New York during all of Phillips- stay in Tallahassee. He was a professional architect, to whom the state of Pennsylvania and the government of France had awarded special medals recognizing the exemplary quality of his work. He had a passionate love for beauty in design, was obsessed with the movement of both time and machines. The mausoleum lot was purchased for $25 from the city in 1907, presumably soon after Philips moved to Tallahassee. Beginning with his arrival, his Tallahassee experience was one of almost total isolation. The only person in whom he would confide anything about himself or his interests was his lawyer. State Sen. William C. Hodges, who was committed by professional standards not to divulge his confidences. After Phillips' death, meager facts were learned from Sen. Hodges and his wife, both of who are now deceased. Mrs. Hodges got the impression that her husband's client was a wealthy, cultured gentleman, separated from his wife and children, who had practiced his profession from offices in New York. He had finished a successful career and wanted to live out his life alone in a "sleepy southern town. Local records do reflect some continuing contact with his family, his wife joining in executing some deeds, but she did this from New York. People who rarely got a glimpse of him described Phillips as an old man, thin of frame, who was stooped and walked with a cane, and had a beard that hung to his waist This recollection was likely from the years not long before his death in 1919. He acquired some lots just off Gaines Street about a block and a hall from the railroad station and here, mostly with his own labor, he built and moved into a small but architecturally beautiful little house with an attached high brick clock tower with a face at the top about 3 feet in diameter. He imported from abroad wooden clock works, which were said to keep perfect time with a soft clucking sound he could hear from his living quarters. In those days, observing the time was an important part of a man's living routine. The image of the conductor in his dark blue hat, coat and vest standing by his passenger step entrance, holding his watch in his hand, attached to a drooping chain, was a vital part of almost every railroad station scene. No one recalls ever seeing Philips in a bank, post office, church, school or other place where groups of people normally would gather. Obviously, he loved his new home. Surrounded there by good books, good art, comfort and serenity, he could hear his closest friend, the big clock, and check the trains coming and going, noting when each was on time, early or late. Late in his life, when he was working on the mausoleum, Phillips kept a little cot inside. When he would grow hot or tired, he would stretch out on it. After finishing his mausoleum, Phillips then built a casket with his own hands from local cherry wood. It was as carefully finished as a piece of fine furniture, and he placed it in the mausoleum alongside his "resting cot" He then called upon Mr. Culley, the local undertaker, had him meet him at the mausoleum, where he showed him exactly how to put his body in the casket, close and seal it, and then seal the mausoleum entrance from the outside. He made no arrangements for any funeral services. In the first days of November 1919, Phillips made his last visit to see his one friend. Sen. Hodges. He gave him a key to the marble door of his mausoleum, explained that his casket was inside and that he would be found either there or at his clock house when he died, which likely would be very soon. He Informed Hodges that he had completed burial arrangements with Mr. Culley, and asked him upon his death to advise his wife and two daughters in New York. Who was this extraordinary man? Why did he come to Tallahassee? Was he hiding from himself? Why did he love beautiful things, but still not want to be identified with them? The only answers he left are hidden in the mausoleum, and in the rubble of the old clock house. Dusty reminders of the great elegance he gave to them. After Phillips' death, one daughter came from New York at the invitation of the Hodges's. It is not known what she found, but she filed a petition for the administration of her father's estate; no inventory, nothing else was filed, not even an application for her discharge. Reportedly she brought and left to be placed in the mausoleum by Hodges the two medals from Pennsylvania and France, attesting her father's professional achievements. And back of the hand on the throttle is ever a daring dream." But many dreams are broken. Some from ideas that simply could not be proved. Others because in the stress of proving, stabilizing support becomes lost. I firmly believe that Phillips had a dream that became broken. I believe that a great passion of his most active years was how to cope with time. How to develop a system of time that could be uniform, of worldwide application, so that peoples everywhere could be governed by the same calculations. We take this for granted now, but it was not always so. When Phillips was in his prime the American railroads were in the vanguard of those seeking to lead the world away from time chaos and confusion and to the acceptance of important uniform standards. The U.S. Congress was deeply involved in this also. Meetings were held in the United States and elsewhere over the world with delegates representing many nations. I believe the young Calvin Phillips became deeply involved in this cause to the exclusion of most all other interests and that this brought him into the meetings and that this struggle became the most dominant influence in his life. On the morning of Nov. 19, 1919, a casual visitor saw that the mausoleum door was ajar. The evening before, Phillips had planned it just this way. He sat on his cot inside with his waiting casket at his side, listening for the train from the East. As it crossed a part of Lake Lafayette 5 miles out of Tallahassee he heard the whistle strong and clear, and the purring throb of wheels on rails caressed his whole body. He heard the bell clanging as the train came to a slow, hissing stop at the station, under the watchful eye of his clock on the hill. He could see the "conductor helping his passengers to depart. "Everything is on time," he said softly as he stretched out on his cot. Resting there he heard the bell warning new passengers that boarding time had come. He could see the conductor checking his watch and calling "all aboard." Moments later he heard the whistle as the train gained speed moving westward. Sounds became fainter. He was soothed to feel that he could still hear the movement of his clock keeping his time in the tower. Then everything became silent. So long forever.